Whether they're the starting points of incredible campaigns, communities facing unfathomable dangers, or merely placed for adventurers to rest and resupply, vibrantly detailed towns are vital to any fantasy adventure. 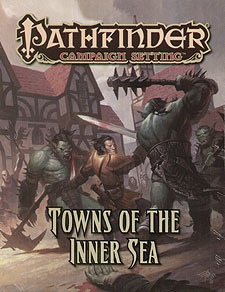 Towns of the Inner Sea explores six small but richly detailed settlements from the Pathfinder campaign setting. Each entry provides insights into the town's history, culture, and residents, as well as what danger lurk in the shadows. Numerous adventure hooks, full-page maps, and stat blocks for key NPCs make these towns fully realized settings, ready for Game Masters to drop into campaigns whenever they're needed. Pezzak: This sheltered port defies the rulers of the devil-dominated nation of Cheliax, its rebel spirit burning strong despite its scheming overlord.